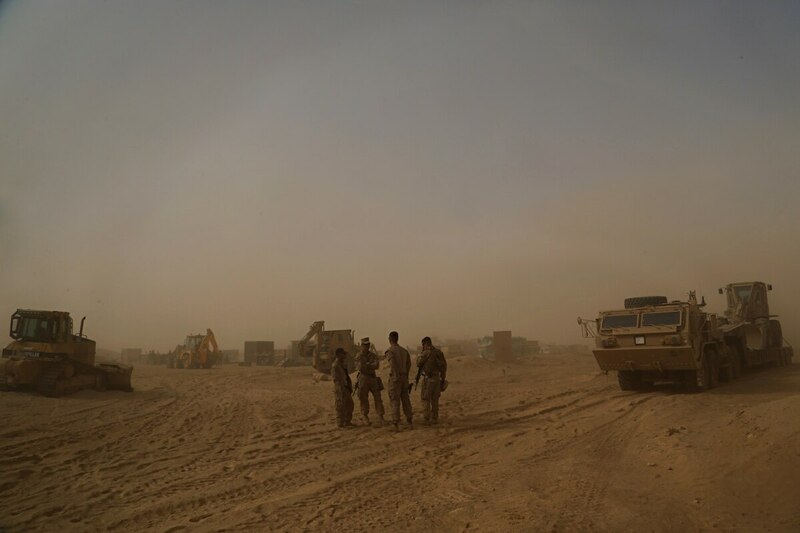 QAIM, Iraq — The US-led coalition’s newest outpost in the fight against the Islamic State group is in a dusty corner of western Iraq near the border with Syria. Here, several hundred American Marines operate close to the battlefront, a key factor in the recent series of swift victories against the extremists. The Americans directed Iraqi troops in their victory last week recapturing the nearby border town of Qaim, the militants’ last urban holding. Now the Marines will lead the equally difficult task of clearing the extremists from their last redoubt: a large stretch of empty desert north of the Euphrates River adjoining the border with Syria. They also face the possibility of friction with Iranian-backed Iraqi Shiite militias that are increasing their own presence in the border region. Under a plastic tent, the Marines run an austere joint command center about 20 kilometers (12 miles) from the border. A dozen monitors relay surveillance footage and troop positions in the town of Qaim nearby. 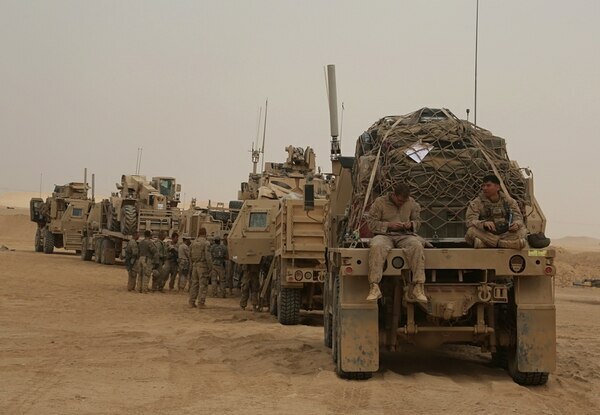 Using racks of radio and satellite equipment, the coalition forces and Iraqi officers at the base pass information between forces on the ground and al-Asad air base, the coalition’s main base in Anbar province some 130 kilometers (80 miles) to the east. Such outposts have become more common the past year, bringing the Americans out of main bases and closer to the action. U.S. commanders say the tactic has paid off in the swift rollback of the Islamic State group. The capture of Qaim completed the sweep driving ISIS from major towns along the Euphrates Valley in Iraq. Along the river on the Syrian side, Syrian government forces took the city of Deir el-Zour last week and the border town of Boukamal facing Qaim on Thursday. U.S. Marines Col. Seth W. B. Folsom, commander of Task Force Lion, oversaw the Qaim fight and said he expects clearing and holding the retaken territory in Anbar to be more difficult than the assault itself. Iraq’s Popular Mobilization Forces — the mostly Shiite and largely Iranian-backed paramilitary forces — have also built up their presence along Iraq’s border with Syria. Coalition forces do not directly coordinate with the PMF, but rely on the Iraqi military to relay their movements to avoid striking the fighters. U.S. Marines Maj. Greg Duesterhaus said the PMF presence complicates things but is not a great concern. “They are part of the forces that are out there on the battlefield,” he said. The growing numbers of coalition troops are stretching the capacity of Anbar’s bases. Notices warning of water shortages hang in bathrooms and showers at al-Asad. At Qaim, Marines ration water. Daily convoys leave from al-Asad to the Qaim outpost carrying water, food, ammunition and building supplies. They travel along desert roads for a tedious seven-hour journey. Storms whip up powder-fine sand, reducing visibility and halting traffic for hours. Lack of Iraqi military escorts sometimes leaves convoys stuck for hours. Without electricity, cell phone service or internet, Marines at the Qaim outpost pass the evening hours smoking cigarettes and talking. They may feel a sense of accomplishment in the gains against ISIS — “but it’s not a sense of finality,” one Marine staff sergeant said. 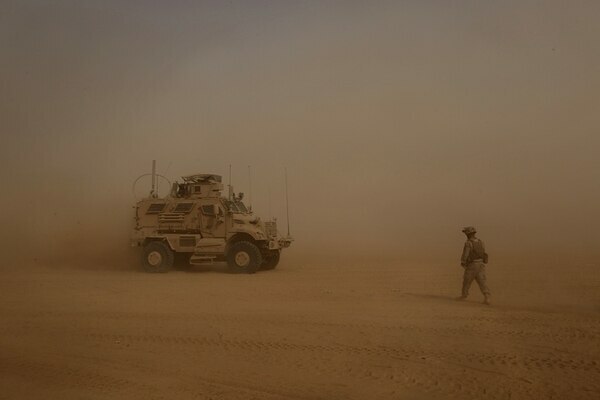 He served in Anbar in 2007, unlike most of his comrades, who are on their first deployment to Iraq. He never thought he’d be back, but now believes there will be a U.S. presence in Iraq for generations to come. Associated Press writers Qassim Abdul-Zahra and Sinan Salah in Baghdad contributed to this report.